With age, the tissues of the respiratory tract lose elasticity and become more rigid. Similar rigidity in the chest wall, combined with arthritis and loss of strength in the breathing muscles, results in an overall decrease in compliance and in lung capacity. Reduction in protective mechanisms, such as phagocytosis in the lungs, leads to increased susceptibility to infection. The incidence of emphysema increases with age, hastened by cigarette smoking and by exposure to other environmental irritants. Although there is much individual variation, especially related to one’s customary level of activity, these changes gradually lead to reduced capacity for exercise. The bronchoscope is a rigid or flexible fiberoptic tubular instrument used for inspection of the primary bronchi and the larger bronchial tubes (Fig. 14-13). Most bronchoscopes are now attached to video recording equipment. 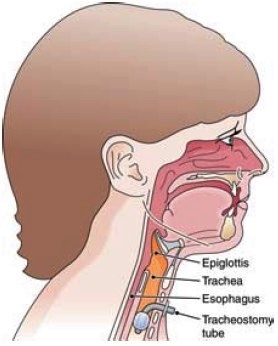 The bronchoscope is passed into the respiratory tract by way of the nose or mouth and the pharynx. It may be used to remove foreign bodies, inspect and take tissue samples (biopsies) from tumors, or collect other specimens. Children inhale a variety of objects, such as pins, beans, pieces of nuts, and small coins, all of which a physician may remove with the aid of a bronchoscope. If such items are left in the lung, they may cause an abscess or other serious complication and may even lead to death. Oxygen therapy is used to sustain life when a condition interferes with adequate oxygen supply to the tissues. The oxygen must first have moisture added by bubbling it through water that is at room temperature or heated. Oxygen may be delivered to the patient by mask, catheter, or nasal prongs. Because there is danger of fire when oxygen is being administered, no one in the room can smoke. A suction apparatus is used for removing mucus or other substances from the respiratory tract by means of negative pressure. A container to trap secretions is located between the patient and the machine. The tube leading to the patient has an opening to control the suction. When suction is applied, the drainage flows from the patient’s respiratory tract into the collection container. A tracheostomy tube is used if the pharynx or the larynx is obstructed. It is a small metal or plastic tube that is inserted through a cut made in the trachea, and it acts as an artificial airway for ventilation (Fig. 14-14). The procedure for the insertion of such a tube is a tracheostomy. The word tracheotomy refers to the incision in the trachea. Artificial respiration is used when a patient has temporarily lost the capacity to perform the normal motions of respiration. Such emergencies include cases of gas or smoke inhalation, electric shock, drowning, poisoning or paralysis of the breathing muscles. A number of different apparatuses are used for artificial respiration in a clinical setting. There are also some techniques that can be used in an emergency. Many public agencies offer classes in the techniques of mouth to-mouth respiration and cardiac massage to revive people experiencing respiratory or cardiac arrest. This technique is known as cardiopulmonary resuscitation, or CPR. These classes also include instruction in emergency airway clearance using abdominal thrusts (Heimlich maneuver), chest thrusts, or back blows to open obstructed airways. 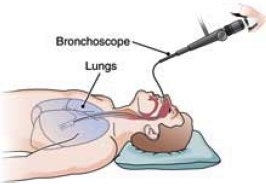 Figure 14-13 Use of a bronchoscope. Figure 14-14 A tracheostomy tube in place. Respiratory therapists and respiratory therapy technicians specialize in evaluating and treating breathing disorders. Respiratory therapists evaluate the severity of their clients conditions by taking complete histories and testing respiratory function with specialized equipment. Based on their findings, and in consultation with a physician, therapists design and implement individualized treatment plans, which may include oxygen therapy and chest physiotherapy. They also educate clients on the use of ventilators and other medical devices. Respiratory therapy technicians assist in carrying out evaluations and treatments. To perform their duties, both types of practitioners need a thorough understanding of anatomy and physiology. Most respiratory therapists in the United States receive their training from an accredited college or university and take a national licensing exam. Respiratory therapists and technicians work in a variety of settings, such as hospitals, nursing care facilities, and private clinics. As the American population continues to age, the prevalence of respiratory ailments is expected to increase. Thus, job prospects are good. For more information about careers in respiratory therapy, contact the American Association for Respiratory Care.